Clean, wash and prepare all vegetables for the braise. Feel free to leave the skins on the carrots and turnips. Prepare herbs by bundling and tying them together with butchers twine (make a bouquet garni). Brown the butter in a heavy-bottomed sauté pan on medium-high heat. Mix a liberal amount of salt and pepper with the flour and dust each chicken leg with the mixture. Place a few chicken legs in the pan, avoid crowding, and brown on all sides. If the flour begins to burn, lower the heat under the sauté pan. Transfer to a large braising pan; repeat process until all legs have been browned. To sauté pan, add the onions, garlic and carrots; sauté until caramelized, then scrape vegetables over chicken legs in the braising pan. Brown 6 of the 12 pieces of bacon in the same pan until crisp; remove and add to chicken mixture. Cook mushrooms in bacon fat until golden brown, then add to chicken and vegetables. Pour in wine, deglaze pan and scrape all bits of chicken and vegetables from the bottom; pour into braising pan. Add the rest of the vegetables, the bouquet garni and the chicken broth. Bring mixture in pan to a simmer; cover. Cook for approx. 1 hour. Chicken should be fork tender; if not, cook for an additional 15-20 minutes. While the chicken braises, brown the other 6 pieces of bacon and set aside; reserve until later. When the legs are cooked, carefully remove them from the pan (along with the mushrooms) and set aside to rest. Keep warm. Remove bouquet garni and discard. Purée liquid and vegetable mixture using an immersion blender (easiest) or by transfering the mixture to a blender in several small batches. Return mixture to the stove over medium heat; reduce liquid volume by half its original volume. Strain the liquid through a fine sieve strainer and keep warm. Taste; adjust seasoning with salt and pepper if necessary. 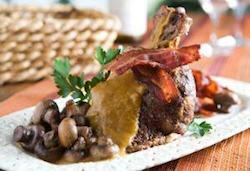 Transfer Coq au Vin to a serving platter; garnish with mushrooms and reserved crispy bacon. Spoon the braising liquid over dish and serve while hot. Serve Coq au Vin with Gruyere Mashed Potatoes and Roasted Baby Root Vegetables. This entry was posted in All Posts, Food Pairing on July 14, 2014 by twistedtwig.